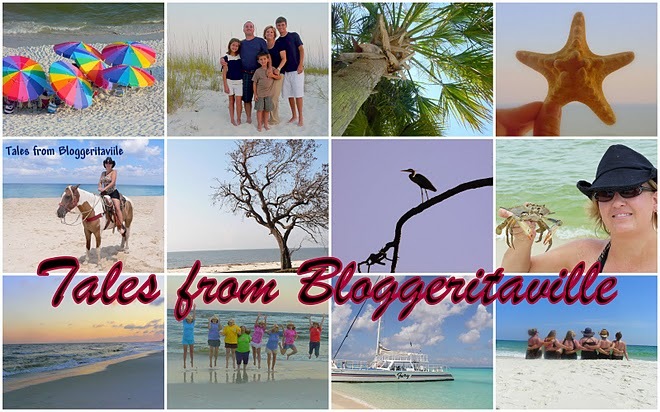 Tales from Bloggeritaville: A Smorgasboard of Cinco and Carnivals=FIESTA! A Smorgasboard of Cinco and Carnivals=FIESTA! Welcome! I am so glad that I am back. I had quite the time weening myself away from the computer and all my bloggy pals last week. I came to realize, or rather confirm what I already knew-I enjoy hearing from you, I enjoy reading your blogs, and I enjoy the camaraderie. I missed all of that and am glad to back in the swing of things. I am appreciative of you, really I am. I thank you for your following, your friendship and kinship and support. 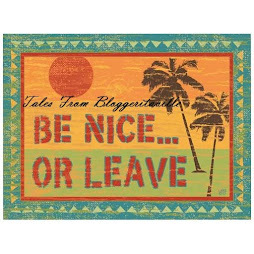 Like meeting a neighbor every morning at the back fence or over coffee, I have come to depend on this blog for the great kinship, friendship, advice and inspiration that I receive from you. For that, I thank you from the bottom of my heart! I also want to extend a heartfelt thanks to Chandy for hosting Thrifty Thursday last week. Mucho, gracias! Now onto the post at hand....It's Thrifty Thursday! Thrifty Thursday is a show and tell of sorts. It is time for you to showcase your thrifty find. It can be an old find or a new one. It might be something that you found at a thrift store, a consignment store, flea market, garage/yard sale, dumpster diving, even antique stores. It's it was a thrifty find, then it meets the requirements. I am not picky, It can be a great pair of boots & a killer vintage dress, jewelry, home decor, even fishing lures. It is your thrifty find. Tell me about it.Where did you find it? What is it? What do you plan to do with it or how do you plan to use it in your home? Do you want to sell it? Thrifty Thursday's are about the thrill of the hunt...and the treasure you found. So....do show and tell! Be sure to grab a button and link back. 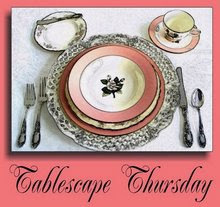 Tablescape Thursday is hosted by the ever gracious and lovely Susan of Between Naps on the Porch. Foodie Friday is hosted by Designs by Gollum. Be sure to go by and see all of the participants of this most Tasty day of the week! I am combining all of the carnivals into one post this week, as I have much catching up to do! This Friday is Cinco de Mayo, it's a perfect time to celebrate, and it just happens to be the theme to this week's Foodie Friday. It's also my theme for my tablescape, And you can probably guess what resources I used to decorate....thrifty ones! First for the menu, which I will be making on the actual Cinco De Mayo. My dear friend, Zinnia has taught me some great recipes from her native Mexico. It's some of these authentic Mexican recipes that I am preparing for our fiesta! Crush ice with rum in blender. Add one can of limeade and strawberries. Blend together. Serve in margarita glasses. My tablescape consist of thrifty finds. The tablecloth is an actual Mexican blanket, a thrift store find. The black plates as well as the colorful bowls, I have shared before, both are thrift store finds. The margarita glasses are handpainted, a Dollar Tree find. The cut glass pitcher is an inherited piece, as is the rooster, which came from my grandmother's estate. All make up for my idea for a fun fiesta! 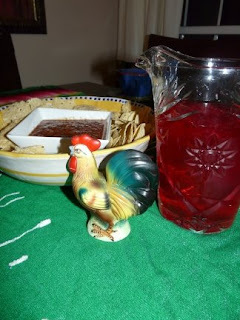 I hope you can use one or more of these ideas for your fiesta! Happy Day! Come back tomorrow for some of the lowdown of my vacation adventures, in the meantime...I need a vacation from my extended vacations. I know, that is so bad...but I have literally traveled approximmatley 650 miles over a long weekend. After a quick nap...You'll find me over at your place playing catch up! Leave me a "roadmap". OLAY! I will be adding more links here within my post throughout the day as people link up. This Mister Linky is "old school" and not my favorite, in fact my least favorite, but for soem reason I have problems getting the newer version to run. Certainly the error of the one behind the keyboard. Sorry! Welcome to the party! Welcome back - I missed you! Welcome back. Love that card. I hope my post works for this week. Whew, you're back. I've missed you. 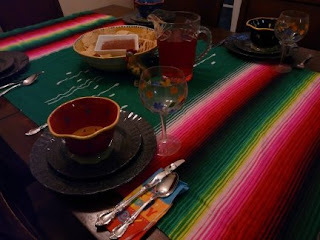 I really like the way you combined the bright colors of the sarape (Mexican blanket) with the dark place settings. I had my eye on that rooster as soon as I saw it! Love it! So glad it's an heirloom, that makes it even more special. Hope you are having a fabulous sleeping experience :) We'll see you in blogland tomorrow. Missed ya, glad yer back chica! I joined TT while you were gone, so it's nice to finally meet you! I love nothing better then to scour garage and church sales so TT is great fun for me. I almost missed the Mr. Linky...he seems to have shrunk a bit. Leigh, I love your smile on that first picture! So you! I'm glad to be part of the fun again. Is Mr. Linky OK or is it just my computer? Welcome back, my friend! Did you have a great time with your friends? It's always nice to getaway and it's nice to get back home again!!! Girl, I love your Cinco de Mayo tablescape! Oooh...the bright colored sarape is just perfect for a Mexico celebration! 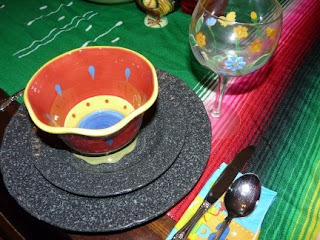 I think that black placesettings look great with the vivid colors of the sarape!!! So pretty! And...your menu sounds scrumptious!!! What time did you say the party started? hehe!!! Your party looks awesome and the menu looks delish! I'll join up with some thrifting next week! What fun! I'll have to try the rum-rita. Love margaritas, but, like you, tequila (pronounced "ta kill ya" at my house for it's murderous properties)is not my friend! Well YUM and cool, all at the same time! Missed ya girlie!! Tomorrow is my 16th Anniversary - hubs and I spent our 'Moon in Cancun, and we were there for Cinco de Mayo! Way cool!!! Hey, I linked up for the party!!! Thanks for hosting Leigh!! Your Cinco De Mayo party looks fun....Good idea to get the party started early so you can celebrate ALL weekend! I'm gonna have to try your version of Margarita's....I'm not a big fan of tequila either. Ay yi yi!!! Welcome back! It was a good idea to leave Chandy to pinch-hit for you; she did a grand job. Love the cinco de mayo menu -- I'm going to have to expand my culinary wings and try more Mexican fare; it's so delicious. And it means I will need brighter dishes, right? Way to multi-task girl. Make mine tequila please. Lots of hot spice in the food. Mmmmm good. Thanks for having me over. I always need a vacation from my vacations. Great Cinco de Mayo table. 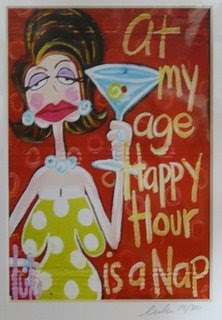 I am going to make me a Rumrita (virgin of course) and some salsa & celebrate. Love the funny cartoon at the end of your post. Now go take a nap! I thought I posted here! Great post, Happy May 5th..!! Very festive table..
Glad you had fun at the beach. I'm joining in for Thrifty Thursday, just getting to it late. Sorry about that. I love Mexican food. What a wonderful looking menu. Your table is very festive. I need to be more fun like that. My kiddos and hubby would love a Mexican meal like that. Hi Leigh! I've missed you! Aren't you just the cutest little thing! Instead of going to Mexico filled with the swine flu, we'll just all come over to your house for the festivities! Your tablescape is beautiful, love the dishes! Wonderful welcome back post, Leigh! Ugh, my first comment didn't go through. Love your fiesta theme. You table setting is beautiful, just love the mexican blanket- great find. Also love all the recipes. Hi, Leigh! I'm glad you're back and can't wait to hear about the fun. The tablescape is just gorgeous, and the recipes sound so good. Those dishes are beautiful! Hugs, G.
So sorry I missed Thursday -- but I will be back this week, I promise!